I suppose it's real now! The webinar is available for purchase now on the Interweavestore.com site. It's scheduled for Wednesday February 12th from 1-2 pm. 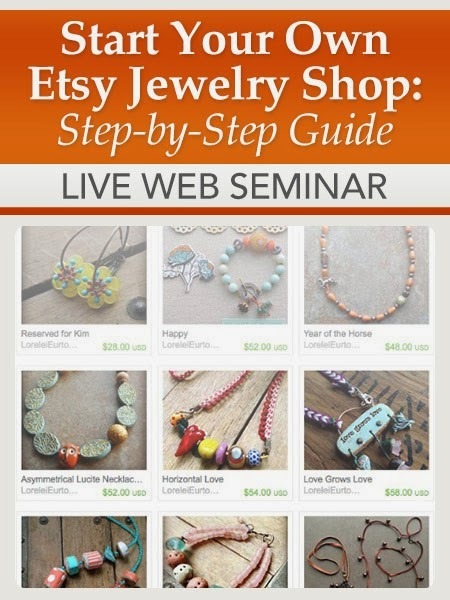 Join me as I talk about opening your own Etsy jewelry store! I will walk you through step by step and give some explanation to each element of listing items on Etsy. I will talk about branding your store, and how to use Social Media to advertise. It's going to be chock full of all sorts of information and I hope that if any of you are thinking about possibly venturing out into the world of online selling using Etsy, this webinar will be exactly what you need to get you started on the right foot! It's $19.99, and you can sign up today by purchasing tickets for the live webinar. After you've seen it, you'll get an email with the recorded version and then you can go back and listen, pause, write notes, and use it while you are working on opening your shop. If you have any questions during the live show, just jot them down and send them in- I'll answer them at the end of the webinar. I paid to attend the Seminar are could not attend. I have been waiting for the recorded version and I have not received it! I emailed the company and they did not answer me? Please forward me the recording or send me back my money. I think that when you pay for something someone should respond when you do not get what you pay for!!! Please let me know what your going to do about this? I sincerely apologize that you haven't heard back from Interweave about your purchase. I have forwarded your message on to my contact there, and hopefully you'll hear something from them this coming week. I have no control over what happens at Interweave as I am a 3rd party designer living across the US from them. But I will always do what I can in cases like this. Please be patient, I am sure they will get you a copy of the downloadable version as soon as possible. Thank you.